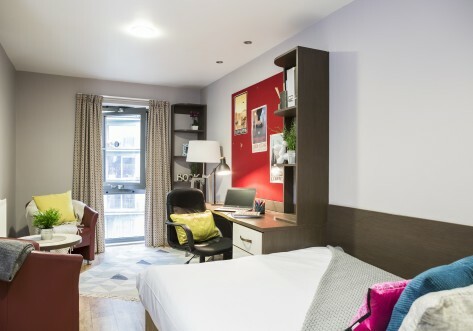 Situated in Camden Town, one of the most creative, culturally diverse and colourful parts of London, Hawley Crescent student accommodation offers some of the most stylish student living in the capital. 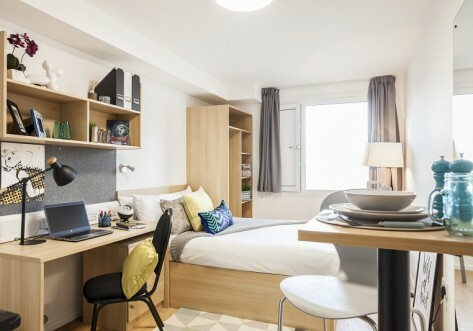 You’ll be located a short distance from universities such as UCL, Middlesex University, St Martins College of Art and Design, Central Saint Martins, Central School of Speech & Drama as well as many others. 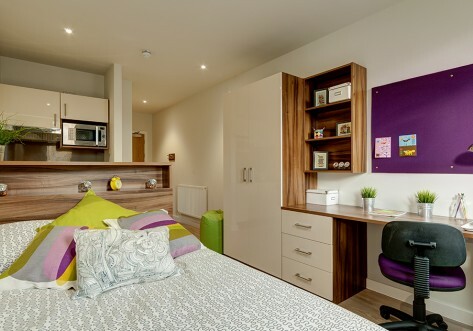 Hawley Crescent is a contemporary student accommodation in an amazing location featuring student rooms decorated and equipped to an impeccable standard. Every student studio or twin studio comes with a large, luxurious bed, your own stylish en-suite bathroom, a TV, and a private kitchen area. After a hard day’s work, why not relax in the rooftop terrace offering fabulous panoramic views across the city. To ensure you feel secure, there is a security team on site at night and secure door access to the building. The hospitality team are on hand to help during the day to answer your questions and to help you get the most out of this vibrant and effervescent area. Hawley Crescent is based in one of the most vibrant and diverse parts of the city where there’s something for everyone. The world famous Camden Market with its dazzling variety of colourful shops, trendy bars, cool cafes and restaurants is close by. If bargain hunting for that special vintage piece is your thing, then why not try Camden’s retro and antique markets? At Hawley Crescent you’ll have Regent’s Canal as a neighbour, so enjoy people watching over a coffee at Camden Lock, take a boat tour to Little Venice, or simply take a waterside walk. If you prefer wildlife to nightlife, then ZSL London Zoo is also close at hand. Camden Town is one of London’s top destinations when the sun goes down. Sample a drink in one of the many pubs and bars or catch some live music at venues, including the iconic roundhouse. The opportunities to meet friends old and new are endless is this cosmopolitan area. When you have all this within a short walking distance, and the rest of the capital easily accessible via the nearby Camden Town Tube station and Euston train station, why would you want to be anywhere else? Hawley Crescent offers the best in stylish student accommodation in one of the most colourful areas of London. Measuring around 27m² with two high rise ¾ beds, an en-suite bathroom, two study areas and two wardrobes. The shared area includes two sofa chairs and kitchen area with TV and up to 100Mbps WIFI throughout. Measuring around 28m² with two ¾ beds, an en-suite bathroom, two study areas and two wardrobes. The shared area includes dining space and kitchen area with TV and up to 100Mbps WIFI throughout. Studio measuring around 15m². It is a self-contained studio with a ¾ bed, an en-suite bathroom, study area, kitchenette, dining space and large wardrobe. Studio measuring around 20m². 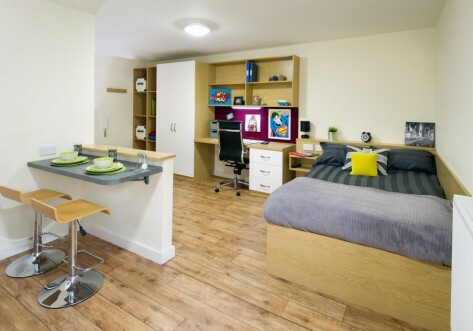 It is a self-contained studio with a ¾ bed, an en-suite bathroom, study area, kitchenette, dining space and large wardrobe.